I bring to your attention Blessed Alexandrina da Costa (pictured above). She lived exclusively on the Eucharist for 13 years and was beatified by Pope John Paul II on April 26, 2004, now himself a Saint! To understand the incredible magnitude of this Eucharistic miracle, consider for a moment that a human being would be lucky to survive even one week without water. There is a beautiful book about her by Francis Johnston in which is revealed the revelation she received that many people would become “ardently Eucharistic” through devotion to her. 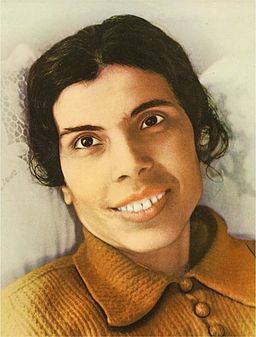 Please note that she was placed in a hospital for forty days and under intense observation was observed to keep her Eucharistic fast, living only on the Bread of Life, which was her sustenance (the official report of Dr. Araujo “confirmed the prodigy as ‘scientifically inexplicable,’ [and stated] it is absolutely certain that during forty days of being bedridden in hospital [Alexandrina] did not eat or drink….”). She died in 1955. The manner in which she predicted the supernatural decomposition of her body was observed to have occurred, and no doubt this sped up the process of her rapid beatification. Here below is a short Vatican summary of her life, which I have edited for this post. “Alexandrina Maria da Costa was born on 30 March 1904 in Balasar, Portugal. She received a solid Christian education from her mother and her sister, Deolinda, and her lively, well-mannered nature made her likeable to everyone. Her unusual physical strength and stamina also enabled her to do long hours of heavy farm work in the fields, thus helping the family income. When Alexandrina was 14, something happened that left a permanent imprint on her, both physically and spiritually: it gave her a face-to-face look at the horror and consequences of sin. On Holy Saturday of 1918, while Alexandrina, Deolinda and a young apprentice were busily sewing, three men violently entered their home and attempted to sexually violate them. To preserve her purity, Alexandrina jumped from a window, falling four metres to the ground. Her injuries were many, and the doctors diagnosed her condition as “irreversible”: it was predicted the paralysis she suffered would only get worse. Until age 19, Alexandrina was still able to “drag herself” to church where, hunched over, she would remain in prayer, to the great amazement of the parishioners. With her paralysis and pain worsening, however, she was forced to remain immobile, and from 14 April 1925 until her death – approximately 30 years – she would remain bedridden, completely paralyzed. Alexandrina continued to ask the Blessed Mother for the grace of a miraculous healing, promising to become a missionary if she were healed. Little by little, however, God helped her to see that suffering was her vocation and that she had a special call to be the Lord’s “victim”. The more Alexandrina “understood” that this was her mission, the more willingly she embraced it. She said: “Our Lady has given me an even greater grace: first, abandonment; then, complete conformity to God’s will; finally, the thirst for suffering”. And so it was that from 3 October 1938 until 24 March 1942, Alexandrina lived the three-hour “passion” of Jesus every Friday, having received the mystical grace to live in body and soul Christ’s suffering in his final hours. During these three hours, her paralysis was “overcome”, and she would relive the Stations of the Cross, her movements and gestures accompanied by excruciating physical and spiritual pain. She was also diabolically assaulted and tormented with temptations against the faith and with injuries inflicted on her body. On 27 March 1942, a new phase began for Alexandrina which would continue for 13 years and seven months until her death. She received no nourishment of any kind except the Holy Eucharist, at one point weighing as few as 33 kilos (approximately 73 pounds). Medical doctors remained baffled by this phenomenon and began to conduct various tests on Alexandrina, acting in a very cold and hostile way towards her. This increased her suffering and humiliation, but she remembered the words that Jesus himself spoke to her one day: “You will very rarely receive consolation… I want that while your heart is filled with suffering, on your lips there is a smile”. As a “testimony” to the mission to which God had called her, Alexandrina desired the following words written on her tombstone: “Sinners, if the dust of my body can be of help to save you, come close, walk over it, kick it around until it disappears. But never sin again: do not offend Jesus anymore! Sinners, how much I want to tell you…. Do not risk losing Jesus for all eternity, for he is so good. Enough with sin. Love Jesus, love him!”. The supernatural confirmations of the Catholic faith – and here quite a recent one concerning this humble child of God- are really quite remarkable and surely should enkindle in our hearts a great desire for the Eucharist, the great Sacrament of Eternal Life.